What it’s about: The second-most famous person to come out of Hannibal, Missouri. Born in a two-room log cabin, Margaret Brown ended up a wealthy philanthropist who fought for numerous good causes, but was remembered then and now for one singular event in her life: surviving the sinking of the Titanic, which earned her the nickname the Unsinkable Molly Brown (although it’s unclear where Molly came from, as she went by Maggie throughout her life). Strangest fact: Brown has been portrayed on stage and screen at least 11 times, and twice by Cloris Leachman. There’s a long list of films about Titanic, and Hollywood jumped on the story immediately, releasing Saved From The Titanic (co-written and starring one of the survivors!) only a month after the event. Joseph Goebbels even commissioned a Nazi propaganda Titanic with a heroic (and fictitious) German First Officer and British villains. Its special effects were impressive enough that some shots were lifted for 1958’s A Night To Remember. Brown didn’t become a character until 1953’s Titanic, in which Thelma Ritter played Brown in a minor role. Brown was front and center in 1960’s hit musical The Unsinkable Molly Brown, with Tammy Grimes originating the title role, and Debbie Reynolds starring in the 1964 screen version. A 31-year-old Cloris Leachman played Brown in an episode of the anthology TV drama Telephone Time that re-staged the disaster, then returned to the role 22 years later for the TV movie S.O.S. Titanic. Biggest controversy: Brown separated from her husband, Jim “J.J.” Brown, in 1909. While the two remained amicable, when he died in 1922 without leaving a will, there was some discord as she and her children fought over the estate. But she otherwise seems to have led an exemplary life. As young Margaret Tobin, she intended to marry for money, but fell in love with Brown, who was no better off than she was. But she ended up with money anyway, as J.J. discovered a lucrative mine and struck it rich. Mrs. Brown dove into high society, becoming a devotee of the arts and learning four languages. She raised funds for a cathedral in Denver, and helped establish the country’s first juvenile court. Two years after the Titanic, Brown ran for the U.S. Senate, but cut her campaign short to volunteer to help France recover from the first World War. 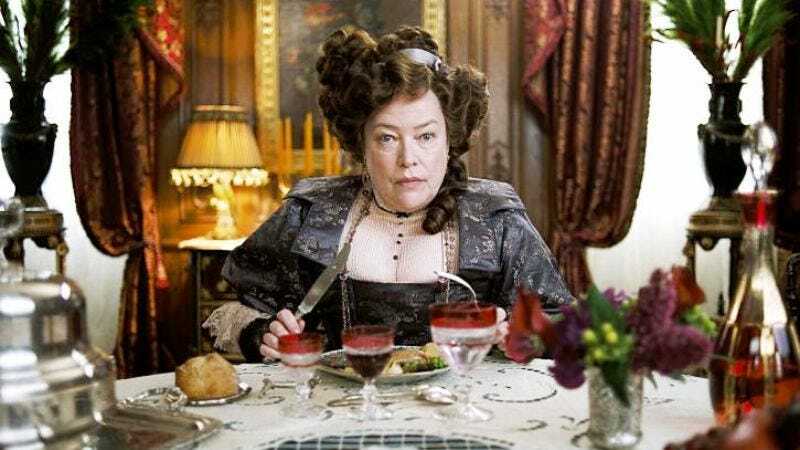 She used her Titanic fame to work for workers’ rights, women’s rights, education, and historic preservation, before dying of a brain tumor at age 65. Thing we were happiest to learn: Brown’s nickname was well-earned, as her actions on the Titanic were genuinely heroic. Once the ship hit the iceberg, she ignored cries of “women and children first” to help others board lifeboats. She didn’t board Lifeboat #6 until a crewman picked her up and dropped her into the boat. The boat was under capacity, and Brown insisted they turn around and rescue more passengers. Ship’s quartermaster Robert Hichens refused, fearing (probably correctly) that the small craft would be sucked down behind the massive ship when it finally sunk below the surface. Lifeboat #6 was also short of oarsmen, with only three men on board, one of whom (Hichens) refused to row. Brown insisted the women should help, in part to keep them warm, and Hichens refused that request as well. Brown ignored him, began passing out oars, and organized the passengers’ efforts to row to safety. Thing we were unhappiest to learn: One tragedy begat another for Brown. Before boarding the fateful ship, Brown was traveling abroad with John Jacob Astor, when she was informed her eldest grandchild, Lawrence, was gravely ill. She bought a ticket for the first available ship to New York—which happened to be the Titanic. But it all worked out in the end, as not only did Margaret reach dry land, Lawrence recovered and lived until 1949. Best link to elsewhere on Wikipedia: The Second World War had the Marshall Plan, the First had the American Committee For Devastated France. Founded by Anne Morgan, youngest daughter of J.P. Morgan, the group (of which Maggie Brown was an active member) raised money in the U.S. to help France recover from the war, and sent American volunteers to help, most notably female doctors who were turned away from military service during the war itself. Further down the wormhole: While Brown remains celebrated to this day for surviving the Titanic, one of her fellow survivors was not. Masabumi Hosono was the only Japanese passenger on the ship, and instead of being celebrated for surviving the disaster, he was soundly condemned. We’ll find out why next week.